GLENFINNAN VIADUCT, in the Highlands, is a magnificent example of construction on the old North British line between Fort William and Mallaig, Inverness-shire. 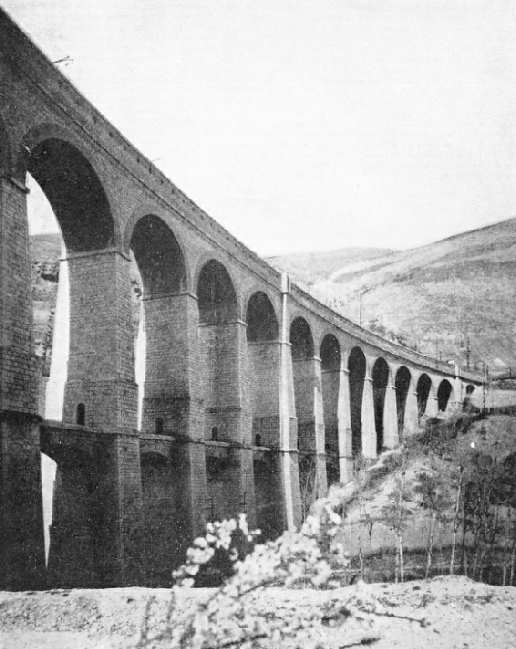 The viaduct, which is built of concrete, has twenty arches. The line here forms a complete semicircle, of which the viaduct forms a part. MANY people are often doubtful of the difference between a bridge and a viaduct. It is not easy to explain this; for, while all viaducts are bridges, all bridges are not viaducts. The Tay Bridge is a viaduct, while the Forth Bridge, except for its approaches, is not. A viaduct might be described as a bridge consisting of a series of relatively short spans, usually of stone or concrete, but sometimes of lattice-girder or trestle construction. All three types are to be found on the railways of Great Britain; but the North American continent is the true home of the trestle. There are certain great bridges, apart from viaducts, which stand out pre-eminently among the bridges of the world, such as the Forth Bridge, the Quebec Bridge in Canada, the Sydney Harbour Bridge, the great bridge at Sukkur, in India, and a few others. But the world's biggest viaducts are far greater in number than the world's biggest bridges. For this reason it will be possible to mention only a limited number of outstanding or typical examples. The Southern Railway is notable for the several great viaducts which it possesses within reasonable distance of London. The Southern is not what one would think of as a mountainous line; the only section of it which could, by any stretch of the imagination, be described as mountainous, is the Exeter to Plymouth line, which skirts the northern side of Dartmoor. Here, as we shall see shortly, is one of the Southern’s greater viaducts. The South of England, however, is decidedly hilly, and it is in consequence of the fine wide valleys that the viaduct-builder has had his innings. ON THE LONDON-BRIGHTON ROUTE, a viaduct that is nearly a hundred years old - it was built in 1841 - carries the electrified main line of the Southern Railway across the Ouse, a mile or so north of Hayward’s Heath, in Sussex. The viaduct has thirty-seven semicircular arches, each with a span of 30 ft. Its total length is 1,475 ft. At the highest point the rails are 96 ft above the ground. The smaller photograph shows a fascinating view through the arches. On the electrified main line from London to Brighton, a mile or so north of Hayward’s Heath, we find one of the finest viaducts in the British Isles. The Sussex Ouse, in this locality, is no more than a stream meandering at the foot of the broad meadows; but in the course of hundreds of thousands of years it has washed out for itself, through the Wealden clay, a valley fit to daunt the engineer of earlier days. Roughly a century ago Sir John Rennie surveyed and planned the Brighton line. It was John U. Rastrick, however, who was responsible for the design of the Ouse Valley Viaduct, and those who know it will agree that it is undoubtedly one of the most beautiful pieces of work of its kind. Built of brick and faced with grey stone, the structure contains thirty-seven arches. Each of the piers is pierced, moreover, by a deep oval space, giving a remarkable degree of lightness, and a still more remarkable view through the viaduct from end to end. Some years ago the writer of this page asked per-mission of a lady to enter her field for the purpose of photographing the viaduct. Much to his surprise, for familiarity breeds indifference if not contempt, this lady, on giving permission, said that she thought “her” viaduct was one of the most beautiful buildings she had ever seen, and compared the view along its length to the nave of a great brick cathedral. It is strange, nowadays, to see the sleek Brighton electric trains gliding across this grand old structure, which has known, successively, the brass-and-copper-bound locomotives of very early days, and the bright yellow locomotives built by Stroudley towards the end of the nineteenth century. Times change more quickly than buildings. Another viaduct on the Brighton line worthy of notice is the Lewes Road Viaduct at Brighton, which bears away in a noble curve across the valley from the main line by Preston Park station. Two other notable viaducts on the Southern Railway were both built by the old London and South Western Company; they differ from one another entirely, as well as from the Brighton line viaducts. One of these is the fine structure of ten arches spanning the valley on the branch between Combpyne and Lyme Regis. 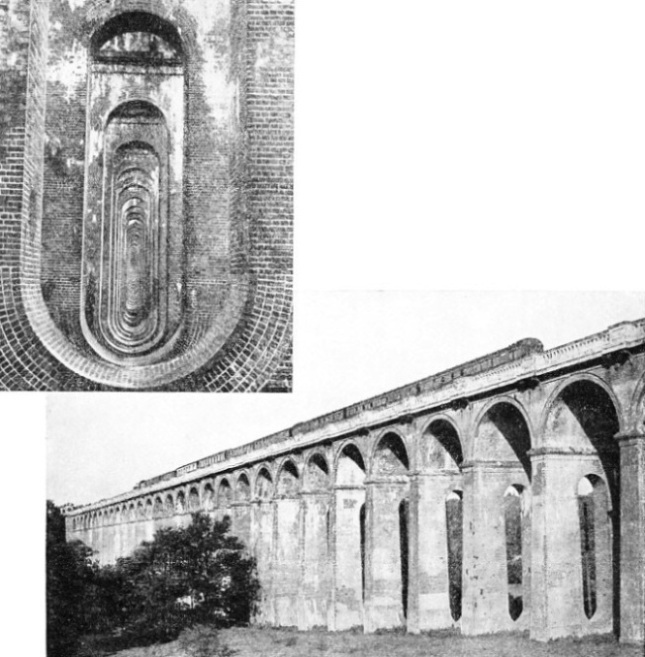 It is not a great viaduct, but its claim to fame lies in the fact that it was one of the very first to be built of reinforced concrete. The fact that it carries only a single track gives it a graceful and slender appearance, which it would otherwise have lost. The most unusual double arch over the deepest part of the valley consists of a masonry insertion in the main concrete span. The other great Southern Railway viaduct is that at Meldon, between Okehampton and Bridestowe, nearly the summit level of the whole Southern system, 950 ft above the sea. This is a structure of steel similar in many ways to the American trestle bridge, and it is one of the sights of the district. The train’s passage of the viaduct reminds one of any place but the South of England; for, though the green marches of Devon and Cornwall stretch away to the north-west, the view on the south side is bounded by the stern grey line of Yes Tor, while an almost Highland stream brawls in the valley, far below. The heaviest locomotives on the Plymouth line, when the viaduct was built, were light 4-4-0 tank engines, like those which worked the Underground in steam days. The viaduct has been enlarged and strengthened since then, unlike the masonry bridges of the Brighton line, which stand up to far heavier loads than their designers ever expected. Some of the heaviest viaduct work on the Southern, however, is barely noticed by the average traveller, though thousands pass over it in an hour. This is the brick arching which carries main and suburban lines above the roofs of South London. That of the Eastern Section alone contains 742 arches and is 30,207 ft long. But the line which stands out above all in the matter of great British viaducts is the London and North Eastern Railway. Of the companies which went to form this fine modern system, the Great Northern, the North Eastern, and the North British were all three rich in viaducts. It was the last-named which owned the largest. and most famous of them all, the Tay Bridge. The first Tay Bridge, designed by Sir Thomas Bouch, was opened in 1878. It was a rather light and airy-looking structure and carried but a single track, but to our grandparents it must have seemed colossal. In the year of its opening, Queen Victoria crossed it and knighted the designer. Now, Sir Thomas Bouch, inexperienced in the strength of East Scottish gales, had calculated to a nicety how much the bridge would carry by way of traffic; but he had not reckoned on the appalling pressure of a winter storm on the side of the bridge. Added to this, some very poor work was put into the building of it. On the evening of December 28, 1879, the evening mail train from Burntisland to Dundee, hauled by North British engine No. 224, crawled on to the bridge in the driving gale. The signalman and groundsman at the south end, who had passed the train-staff to the driver, watched the lights of the train until they reached the high girders in the middle. Then there was a flash of fire, which seemed to fall, and the lights vanished. Girders, train, and seventy-three people had fallen headlong into the surging waters of the Firth of Tay. The Tay Bridge, or what was left of it, was afterwards condemned , and the only survivor was the engine, which was raised and repaired. The new Tay Bridge, designed by W. H. Barlow, is a much more sturdy structure, and was opened on June 13 1887. Its total length is two miles seventy-three yards, or 10,779 feet. It has eighty-five spans, the longest, over the fairway, being 245 ft in length. 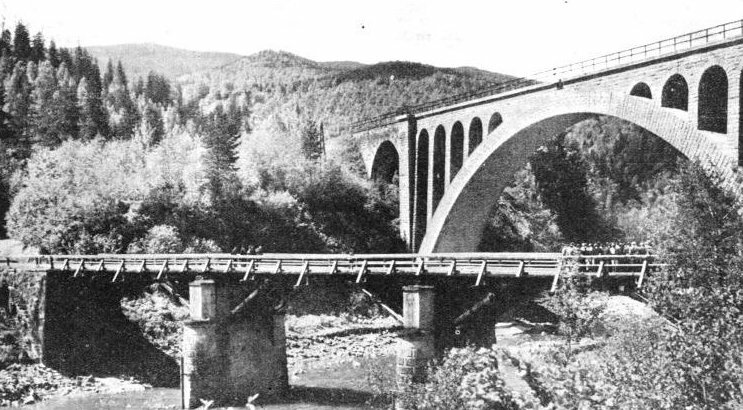 The viaduct consists of lattice girders mounted on columnar piers, with masonry approaches at either end, and there is a clear headway of 77 ft above high-water mark. The train runs on top of the girders, except over the thirteen spans crossing the fairway, where it is inside them. When the present Tay Bridge was built, the heaviest North British express engines weighed only 46 tons 2 cwt without their tenders, while the heaviest main line coaches averaged 12 to 15 tons; yet to-day the bridge takes the heaviest “Pacifics” and “Mikados”, with the exceedingly heavy trains of modern times, as if it had been built for them. The main line of the London and North Eastern, however, meets its first viaduct long before it reaches Scotland. This is the great Digswell Viaduct near Welwyn, on the old Great Northern main line. It is built of masonry, and crosses the valley in a straight line on forty arches. On the same section is another imposing viaduct at Ilkeston; but some of the most remarkable of the LNE viaducts,after the Tay Bridge, are to be found on what used to be the North Eastern Railway. At Berwick there is the Royal Border Bridge, a grand viaduct of stone, crossing the Tweed and its valley on twenty-eight brick-lined arches, at a height of 126 ft above the river. The length of the viaduct, which was opened by Queen Victoria in 1850, is nearly half a mile. Curiously enough, however, many of the old North Eastern’s notable viaducts are not on main lines at all, but on the long cross-country lines linking the North-East Coast with Cumberland and Westmorland. There is the lofty Hownes Gill Viaduct, 175 ft high and having twelve 50-ft arches; but perhaps the most interesting are those on the Darlington-Tebay line, for here we encounter the finest and best British examples of the trestle. SPEEDING ACROSS WELWYN VIADUCT. 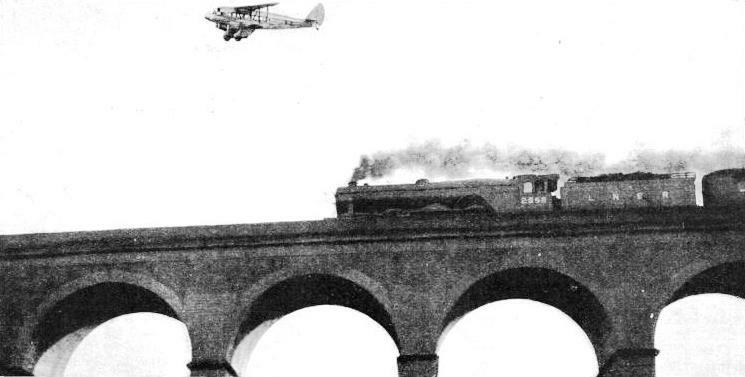 A London and North Eastern Railway train with a Railway Air Services aeroplane flying above. The viaduct, twenty-one and a half miles from King’s Cross, is 1,560 ft long, and has forty arches, each with an average span of 40 ft. At one point the rails are 100 ft above the ground. There are no less than twelve fine viaducts on this relatively short line, and of these, the Belah Viaduct is undoubtedly the most noteworthy. It is an iron trestle viaduct, 1,040 ft long and 196 ft above the lowest part of the valley which it spans. The foundation stone was laid on November 25, 1857, and the whole structure was completed within the astonishing time of four months. Before we leave the LNER we must mention, briefly, the viaducts on the West Highland Railway, which was formerly worked by the North British. 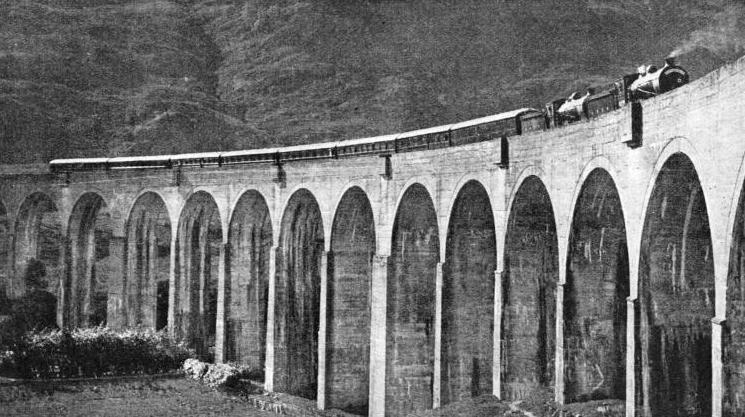 The finest of these is the splendid concrete viaduct at Glenfinnan, in Inverness-shire. It has twenty arches, and is built on a noble, sweeping curve in one of the most beautiful localities in the world. Nor does it spoil the natural effect; the glen is too big for that, and nothing is dwarfed or made incongruous. Of the Glenfinnan Viaduct, J. J. Bell wrote that it was “a thing so delicate that the fairies might have built it.” Only when one sees one of the big “Loch” class engines crossing with a train does one realize how great the viaduct really is. The whole effect is that of a very tiny model railway laid in a stupendous rock-garden. There are many viaducts on the West Highland; another attractive one is that on the famous Horse-Shoe Curve between Tyndrum and Bridge of Orchy, where the train seems literally to be chasing its own tail. The viaduct itself, however, built as it is of steel on masonry piers, is not nearly so attractive as that of Glenfinnan. THE OLD AND THE NEW are splendidly contrasted in this picture, taken at Jaremcze, in the Polish Carpathians. In the foreground is the old viaduct, with the modern structure behind it. Leaving the LNER in the Scottish Highlands, we can join the LMS in that locality, for the old Highland Railway, which now forms the northernmost section of the LMS, has many fine bridges and viaducts. Quite the finest is that crossing the River Nairn on the direct line from Aviemore to Inverness, which is built of Old Red Sandstone. It has twenty-eight 50 ft arches, and one grand arch of 100 ft, going over in a perfect rainbow curve. T he entire structure has a length of 1,800 ft, and the height above the river bed is 135 ft. The Highland main line abounds in fine bridges and viaducts, and another, which is well known, though relatively small, occurs in the world-famous Pass of Killiecrankie. Probably the reason for its popularity is the fact that it fits in perfectly with its beautiful surroundings and, moreover, is a good subject for amateur photographers. Other notable LMS viaducts in Scotland include the Ballochmyle Viaduct in the heart of the Burns country, with its 180-ft arch, and the Broomhill Viaduct at Larkhall, the highest in Scotland. In England, the LMS is poorer in viaducts than the LNER, though there are fine structures here and there, especially on the Midland Division, such as the famous Monsal Dale Viaduct in Derbyshire, which, like the Killiecrankie Viaduct, owes much of its fame to fine surroundings. ON THE ROME-SULMONA ROUTE. The line has been electrified, and the standards supporting the overhead conductors can be seen on the viaduct. This striking photograph was taken from the Sulmona-Scanno highway. At one point this viaduct is over 98 ft high. The Great Western Railway used to be especially noteworthy for the wooden viaducts designed by I. K. Brunel and built across the deep valleys of South Cornwall. After Brunel’s death in 1859, their replacement by more orthodox erections was begun, for they had their disadvantages even in those days; but the last of them - on the Falmouth branch - carried its last train only a year or so ago. The North Eastern also had a big wooden viaduct, at Knitsley, in the Lanchester Valley. This example resembled very closely indeed the typical American trestle, beloved of “Wild West” story-tellers. It is in Wales that we find the best of the Great Western viaducts, and among these are the Crumlin Viaduct and the Dee Viaduct at Cefn. The Crumlin Viaduct is a trestle structure situated between Pontypool Road and Pontllanfraith. It was opened for traffic on June 1, 1857, at which time it was the largest viaduct in the world. It crosses the Ebbw Vale at a height of 200 ft, and is formed into two sections by a queer intervening hill dividing the valley. The main section, on the east side of this hill, is 1,066 ft long. The Dee Viaduct at Cefn is of stone, and contains nineteen 60-ft spans, the deepest arch being 148 ft above the river. Older than the Crumlin Viaduct, this also had in its time the reputation of being the greatest in the world. When we reflect on the fact that Great Britain, except in the west and north, is not a mountainous country, and that even so it contains so many big viaducts, it will be realized that it is impossible to do justice to all the great viaducts of other lands, many of which are exceedingly mountainous. It will be possible, therefore, to mention only a few outstanding examples. Though the Tay Bridge held pride of place among the world’s viaducts until the Lower Zambesi Bridge was built, the Stone Upper Bridge of the East Indian Railway runs it close. The frequent flooding of the rivers in India has necessitated the construction of ninety-three spans, with a total length of 10,052 ft, 727 ft shorter than that of the Tay Bridge. FROM THE SIDE OF A PRECIPICE the Landwasser Viaduct on the line of the Rhaetian Railways in Switzerland carries the trains 213 ft above a valley. The structure was built on a curve of 328 ft radius, and has six arches, each spanning 66 ft. The total length of the viaduct is 426 ft.
One of the most striking journeys in Europe for the lover of great viaducts is that provided by the narrow-gauge South of France Railway from Toulon up into the Maritime Alps at the back of Nice and Grasse. The line twists and turns along the face of the mountain range, and, wherever a deep glen opens its mouth, there is a great stone viaduct. A typical and splendid example is the viaduct spanning the Loup River at Pont du Loup. The South of France Railway (Ligne du Sud de la France) should not be confounded with the former Southern Railway of France, known as the Midi, now amalgamated with the Paris-Orleans. On the last-named line, in Puy de Dôme, is the highest viaduct in the world. This is the Fades Viaduct, the central 472 ft span of which is 435 ft above the river. Switzerland has many notable viaducts, and here again they are remarkable for their height above the valleys they span rather than for their length. The Landwasser Viaduct, on the Rhaetian Railway, 426 ft. Long, has its central span 213 ft above the valley, while the Solis Viaduct is 292 ft above the river. 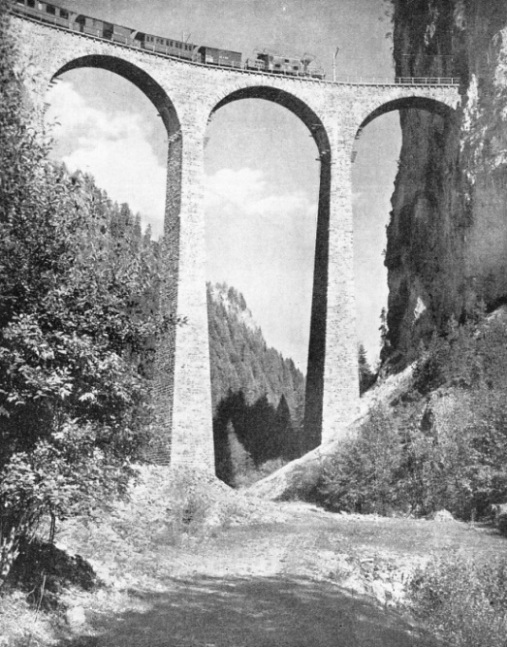 Though not, strictly speaking, a viaduct, the Ponte di Melide, in the extreme south of Switzerland, should be included, since it carries trains. It is a causeway, containing a few spans to allow for the movement of the water, built across the Lake of Lugano at the foot of Monte San Salvatore. It carries the main line of the St. Gothard Railway, connecting Zurich with Milan via Chiasso. A similar causeway carries the LMS Railway’s Dornoch branch across Loch Fleet in Sutherland. This latter was built by the great Thomas Telford before the days of railways, the railway line having been added during the present century. On the North American continent we find many splendid viaducts, one of the best known being that at Lethbridge, just under 760 miles west of Winnipeg on the Canadian Pacific Railway. It is of trestle construction, but it is built of steel instead of iron. At one point the rails are 314 ft above the river below. The trestles consist of thirty-three steel towers, and the total length of the structure is 5,327 ft. The Lethbridge Viaduct, like most big trestles, is a striking rather than a beautiful piece of work. Generally speaking the American viaducts, big and finely designed as they are, cannot compete with those of Europe in the matter of good appearance. The United States contains two of the most extraordinary pieces of railway viaduct construction in the world. One of these is the Lucin Cut-Off, which, by alternate embankment and trestle-work, carries the Union Pacific across twenty-seven and a half miles of the Great Salt Lake, Utah. The lake, vast as it is, is relatively shallow all the way, and the building of the cut-off was a matter of time, money, and perseverance rather than superhuman battling against the elemental forces. The same applies to the Key West Extension of the Florida East Coast Railway, which again, by means of alternate embankment and viaduct, crosses 114 miles of the Gulf of Mexico, running from “key” to “key”, as shown in the chapter “Out to Sea by Train”, beginning on page 109. 12,000 TONS OF STEEL went to the building of the great Lethbridge Viaduct which carries the railway across the Belly River, Alberta. The viaduct, 5,327 ft long, is supported by thirty-three steel towers. At the centre trains are 314 ft above the river. You can read more on “The Forth Bridge”, “Some Wonder Bridges” and “Sydney Harbour Bridge” on this website. You can read more on “Bridging the St Lawrence”, “Building the Menai Bridges” and “Story of the Tay Bridges” in Wonders of World Engineering.